For flow monitoring of aqueous or oily fluids in hygienic applications, EGE says it provides the STD flow controller with an aseptic Varivent F process adapter. The thermal sensor is suitable for use in category 2 hazardous areas. It detects flow velocities between 1 cm/s and 10 cm/s in water and between 3 cm/s and 200 cm/s in oil. Depending on the temperature class of the explosive gas mix it is exposed to, it is suitable for ambient temperatures from -20 °C to 85 °C. 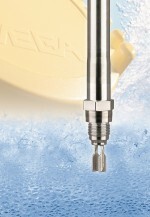 EGE says the process adapter has an IP67 protection rating and withstands pressures up to 60 bar. The flow controller is connected to the SKZ analysis device via a PUR cable.